Catanzaro drilled field-goal attempts of 25 and 38 yards and made two of three extra-point tries in the Buccaneers' 37-34 loss to the Bengals on Sunday. 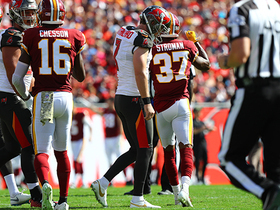 Analysis: Catanzaro missed an extra point for the third straight game following DeSean Jackson's 60-yard touchdown reception in the second quarter. He did make up for it with a perfect showing on field goals, however, pushing his success rate in that category to 83.3 percent (10-for-12). Given the prolific nature of the Bucs offense irrespective of which quarterback is under center, Catanzaro should continue seeing plenty of scoring opportunities. 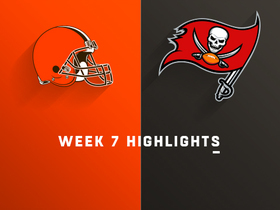 Catanzaro nailed field-goal attempts of 38 and 59 yards -- the latter a game-winning kick in overtime -- and missed a 40-yard try wide right as time expired in regulation during the Buccaneers' 26-23 overtime win over the Browns on Sunday. He also made two of three extra-point attempts. Catanzaro drilled his only field-goal attempt from 35 yards and made two of three extra-point tries in the Buccaneers' 34-29 loss to the Falcons on Sunday. Analysis: Catanzaro saw only one field-goal try for the second straight game, although he's now been true on the four attempts he's taken over the last three contests. The 27-year-old has misfired on a pair of extra-point tries overall this season, but he's largely been a stable placekicking option for the high-powered Buccaneers offense. Catanzaro should continue seeing a fair share of scoring opportunities when Tampa takes on the Browns in a Week 7 matchup. Catanzaro drilled his only field-goal attempt (30 yards) and also converted his only extra-point try in the Buccaneers' 48-10 loss to the Bears on Sunday. Analysis: The veteran kicker made good on his only chances in the blowout loss, taking his field-goal tally for the season to a solid 5-for-6 (83.3 percent). With Jameis Winston likely returning to his starting quarterback job following a Week 5 bye, Catanzaro should continue seeing the consistent scoring opportunities he enjoyed over the first three games of the season before Sunday's outlier. Catanzaro hit both of his field-goal attempts (21 and 28 yards) and all three extra-point tries in the Buccaneers' 30-27 loss to the Steelers on Monday night. Catanzaro did not attempt any field goals but did nail three of four extra-point tries in the Buccaneers' 27-21 win over the Eagles on Sunday. Analysis: Catanzaro now has missed a field-goal and extra-point attempt apiece over the first two games, but with the Buccaneers offense humming at an impressive pace behind Ryan Fitzpatrick, those haven't truly come into play. The fifth-year pro hasn't had much of a chance to get into a rhythm with field goals as a result how efficient the team has been over the first pair of contests, but his solid track record in that regard offers reason for optimism. 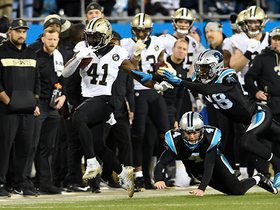 Catanzaro drilled field-goal attempts of 33 and 36 yards, misfired on a 44-yard try and converted all six extra-point opportunities in the Buccaneers 48-40 win over the Saints on Sunday. Analysis: Catanzaro had a mostly successful regular-season Bucs debut, with his one blemish a fourth-quarter attempt that just went wide right with 4:57 remaining. If Week 1 was any indication, the 27-year-old should see plenty of scoring opportunities throughout the season, irrespective of who's under center. Catanzaro converted field-goal attempts of 27 and 26 yards, and misfired from 53 yards in the Buccaneers' 26-24 preseason win over the Dolphins on Thursday. He also made two of three extra-point attempts. Catanzaro hit a pair of 53-yard field goals in Thursday's practice, Carmen Vitali of the team's official site reports. 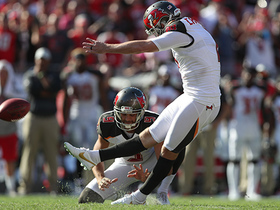 Catanzaro, who's been enjoying an impressive camp thus far, was a perfect 5-for-5 on field-goal attempts in Tuesday's windy practice, Greg Auman of the Tampa Bay Times reports. Catanzaro is joining the Buccaneers, Greg Auman of the Tampa Bay Times reports. 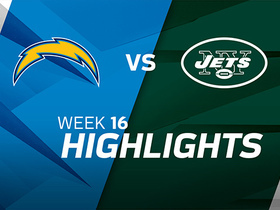 Analysis: Catanzaro converted 25 of 30 field-goal attempts and all 29 of his extra-point tries last year for the Jets, with all five misses coming from the 40-49 range. He struggled in 2016 with Arizona but otherwise has been one of the better kickers in the NFL (84.4 percent on field goals) since entering the league in 2014. The change of scenery improves Catanzaro's fantasy outlook, as the Tampa Bay offense has potential for a breakout, albeit a year later than most expected. Catanzaro connected on 25 of 30 field goal attempts and all 29 of his PATs during the 2017 season. Analysis: Catanzaro was a steady producer during his first season in New York, hitting all of his attempts from 20-29, 30-39 and 50-plus. 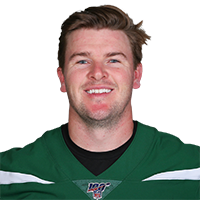 His PATs dropped considerably after moving from Arizona, and while the Jets' offense could improve next season, it's unlikely to be enough to push Catanzaro into another tier of fantasy options, if he stays in New York. Catanzaro did not attempt a field goal but made his lone extra-point try in Sunday's 14-7 loss to the Chargers. Analysis: Catanzaro now carries 98 points into Sunday's season finale against the Patriots. 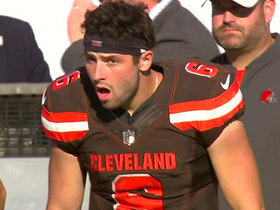 Catanzaro made field goals from 29 and 26 yards while converting his lone extra-point try in Sunday's 31-19 loss to the Saints. Analysis: Catanzaro has now gone six straight games without missing a kick, bringing his season total to 97 points. Catanzaro did not attempt a kick in Sunday's 23-0 loss to the Broncos. Analysis: Catanzaro's stock seemed destined to benefit from playing in Denver's altitude, but the Jets offense unfortunately didn't afford him any scoring opportunities. On the bright side, another seemingly great kicking situation awaits, as New York will play indoors against the Saints come Sunday. Catanzaro converted field goals from 27, 47 and 38 yards in Sunday's 38-31 win over the Chiefs. He also made all three of his extra-point tries. Analysis: Catanzaro's 12 points marked his third double-digit outing of the season. The 26-year-old has gone particularly well lately, as he's averaged nearly nine points over his last five appearances. Catanzaro converted both of his field-goal tries and all three of his extra-point attempts in Sunday's 35-27 loss to the Panthers. Analysis: Catanzaro has scored at least eight points in three of his last four appearances, causing his stock to rise a bit lately. 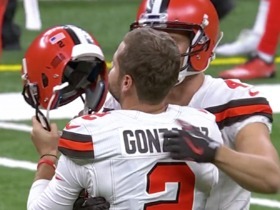 Catanzaro connected on his only field-goal attempt, a 47-yarder, and his only PAT during Sunday's loss to the Buccaneers. Analysis: After multiple field goal and PAT attempts in the last two games, the Jets' offense could do little to keep Catanzaro's streak going. 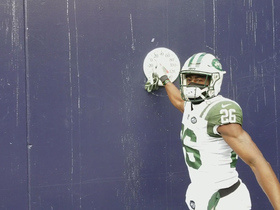 He continues to be a fairly reliable fantasy option, though he won't be confused for an elite player at his position. Catanzaro converted both of his field-goal tries, as well as all four of his extra-point attempts in Thursday night's 34-21 win over the Bills. Analysis: Catanzaro's 10 points marked his second-best total of this season. Through nine games, he now boasts a respectable 65 points.